The Maitar Shebalev synagogue is situated on Maginim Street, opposite the Beirav synagogue and next door to the HaTavshil soup kitchen. It seats around 25-30 men and there is a small ladies room alongside. There is a Beit Midrash (study hall) and the synagogue Rabbi has an outreach program to unaffiliated Jews. The aim of the outreach program is to help fight assimilation by building up a community of people who want to learn more about their Jewish heritage. The organization also wants to enrich the lives of religious people, especially working people, by offering them the opportunity to study Torah with others in a variety of classes and lectures. They follow the sentiments written in Pirkie Avote (Chapters of the Fathers) "you should love your fellow" so out of love for their fellow Jews, they want to bring them back to Torah. They have an open, inclusive approach and are not affiliated to any one sect; seeing themselves just as part of the whole Jewish family (Klal Yisrael). This is an afternoon study program offered to students from the locally affiliated colleges of Bar Ilan University: - Safed and Kinneret Colleges. This program is part of a nation-wide study program, Nefesh b'Yehudi (Jewish Soul) which enables college students to study Torah in a congenial setting. Classes run between 1-5pm daily. There is a regular evening club for boys from 4th grade from all over Safed with opportunities for religious study classes as well as other fun activities like swimming, soccer etc. These classes are offered three nights a week between 7.00-8.30pm and a mini-bus collects and returns the children home. Maitar Shebalev offers a wide variety of lectures to the general public, in both Hebrew and English. Whether you want to learn about 'Shalom Bayit' (peace in the home) Jewish philosophy and education, or just want to learn something a bit different, their classes are always interesting. The speakers they invite are some of the best in the country in their particular field. If you want to be able to attend the talks, Maitar Shebalev will be happy to sms you with the details of their forthcoming lecturers. If you prefer, you can subscribe to their email information update service and make sure you don't miss out. They also hold "Shabbatons" from time to time. 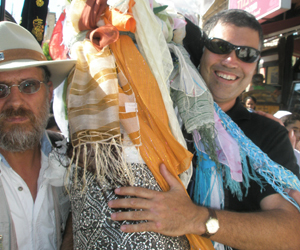 Guest speakers come to Safed and members of the public are invited to participate in a learning experience with them while enjoying a traditional Shabbat. The air-conditioned lecture hall is well equipped with audio visual equipment which enables lecturers to offer up to the minute presentations using all the latest technology. The lecture hall is also available for hire to outside groups and members of the public. The synagogue is one of the few places in Safed that uses the Ashkenazi liturgy prayer book. At the moment there are only regular services on Shabbat. Mincha: 20 minutes before sunset, followed by Kabbalat Shabbat with a talk before Maariv. There is a Daf Yomi (Daily Gemara) class on Shabbat afternoon at 5.15pm.